Walkie Talkies. Analogue & Digital Mode. Compatible with MOTOTRBO Hytera Tier II Radio and its repeater perfectly. NEW Mini Radio BF-T1. Standby current consumption ≤0.18A. Health & Beauty. Digital DM-5R. Features: ☆High &Low Power Switchover ☆Double launch key/Dual Display/Dual Watch ☆Battery saving ☆VOX Function ☆DTMF Signaling/(PTT ID Encode) ☆Time-out Timer (TOT) ☆RM Radio(65-108MHz) ☆Emergency Alarm(SOS) ☆Wide/Narrow Bandwidth Selectable ☆Auto-Back Light ☆Low Battery Warning ☆Relay forwarding confirmed (1750Hz) ☆Tone end of transmissionm ☆U/V Cross Band Dual Watch ☆Multi Scan Mode ☆Built-in LED Flashlight Specification: General Frequency range. Pronto PR-P10M is a professionally designed handheld Marine band radio. Built 100% waterproof, able to flash and float and sustain a white variation in temperatures, it's the perfect tool for larger and small craft alike. 1 x Baofeng Misuta Series UV-5R (VHF136-174Mhz UHF 400-520Mhz). BAOFENG Misuta Series UV-5R. ◈ Misuta UV-5R. ◈ Misuta BF-888S Plus. ◈ Misuta UV-82 Plus. Item Model Misuta UV-5R. Hot Baofeng Model. 1x BaoFeng UV-82 (VHF 174Mhz,UHF 400-520Mhz). 1x BaoFeng Original Earpiece. FM radio (65.0MHz-108.0MHz). Frequency Range: 136-174 & 400-520 MHz. Frequency Range: 65-108MHz(FM Receive only),136-174MHZ and. Baofeng GT-3TP Mark III VHF UHF 136-174/400-520MHz 1/4/8W HT Radio Walkie Talkie. Condition is New. Dispatched with Royal Mail 2nd Class. (1) IP67 waterproof and dustproof (Not diving). 12) Voice Prompt. IP67 waterproof and dustproof (Not diving). 7) Wide/Narrow Band Selection. 3) Dual Band, Dual Display and Dual Standby. 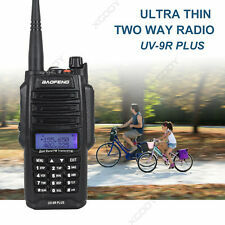 1 X Portable radio BF-UV9R. Baofeng DM-5R Tier II DMR Digital UHF VHF Walkie Talkie Radio Cable Mic. 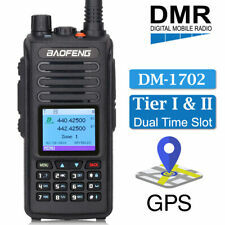 1× BAOFENG DM-5R Tier II. Hot Baofeng Model. Dual Band VHF 136-174MHz &UHF 400-470MHz. Frequency Bands : UHF, VHF. Frequency Range : VHF136-174Mhz UHF 400-470Mhz. 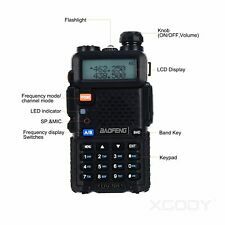 I HAVE A FEW OF THESE POPULAR BAOFENG WALKIE TALKIE, AMATEUR BANDS RADIOS FOR SALE. UV-5R Walkie Talkie UHF 400MHz~520MH and 5W and the Communication Distance is up to 3-5km. This Walkie Talkie is Made of High-quality Poly-carbonate Material, High-intensity, Steady and Durable. 1 x RT84 digital two way radio. Digital and analog compatible, smooth over. Features:FPP, Display, VOX, Monitor, Scanning, CTCSS/DCS, Alarm, Wide Narrow band, User defined side butttons, Squelch level, Keyboard lock, Talk around, SMS, Colour code, Repeater slot, Voice prompt. Walkie Talkies. BAOFENG UV-5R. VHF/ UHF Dual-Band Two-Way Radio Feature. -1 x UV-5R GREEN (VHF136-174Mhz UHF 400-520Mhz). FM Radio (65.0MHz-108.0MHz). The transceiver is a micro-miniature multiband FM transceiver with extensive receive frequency coverage, providing local-area two-way amateur communications along with unmatched monitoring capability. Black Walkie Talkie Adapter 2 Pin For Baofeng 9700 A58 UV9R Motorola GP HT MTX. Walkie talkie Repeater Box for Two handheld radio puxing Kenwood baofeng 5R GT-3. Original Baofeng Speaker Mic Headset For UV-5R A UV-82L GT-3 888s Two Way Radio. Baofeng BF-F8+ Dual Band UHF / VHF 2 Way Walkie Radio.AMATEUR RADIO.NEW. 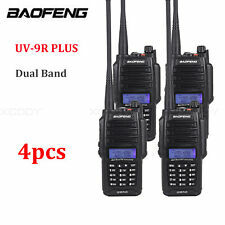 (Model BAOFENG UV-9R Plus. Frequency Range VHF:136-174MHz UHF:400-520MHz. 19) Dual Band, Dual Display and Dual Standby. 12) Voice Prompt. 9) Dual Band Standby. 24) U/V Cross Band Dual Watch. 7) Wide/Narrow Band Selection. Walkie Talkies. BAOFENG UV-5R Green. NEW Mini Radio BF-T1. 5RIII TRI BAND. VHF/ UHF Dual-Band Two-Way Radio Feature. Health & Beauty. FM Radio (65.0MHz-108.0MHz). >Dual-Band Display, Dual Freq. Baofeng UV-9R Plus Walkie Talkie CB Radio 8W High Power VHF UHF Dual Band Handheld Two Way Radio 10km long range Waterproof FM Protable Digital Transceiver. Baofeng UV-9R Plus 8W High Power IP67 Waterproof Two Way Radio Dual Band Handheld Walkie Talkie Upgraded Version of UV9R. Specifications: 1. Model: UV-5R 2. Color: Black 3. Material: Plastic housing 4. Display: 1.5" LCD display professional walkie talkie 5. Frequency Range: VHF 136~174MHz / VHF 220-260MHz / UHF 400~520MHz 6. Storage Channel: 128 7. Channel Spacing: 2.5/5/6.25/10/12.5/20/25KHz 8. Frequency Stability: ±2.5ppm 9. Antenna Impedance: 50ohm 10. Output Power: 5W 11. Modulation: F3E 12. Sensitivity: 122dBm (128dB SINAD) 13. Powered by: 1 x 7.4V 1800mAh battery (included). 8W/4W/1W (Max 8W). The Radio does what it was design to do, low cost and great value. I'm using a MacPro 13" with the latest Maverick OS. The yellow colors around the key pad makes the keys very readable. MOTOROLA GP340 PROFESSIONAL TWO WAY RADIOS / WALKIE TALKIES - VHF 5 WATT. These are ex hire radios. They have all been previously engraved. They have been tested only to check that they turn on and talk back to back and are sold as such. Main Feature GPS function IP67 waterproof Use time-division multiple-Access (TDMA)digital function Dual time slot for repeater Dual time slot for point to point Firmware upgradeable Lone worker Encryption function Compatible with Mototrbo TierⅠ&Ⅱ Single call,group call and all call Analog and digital combiend Remote kill /stun and activate Comply with digital protocol ETSI TS 102 361-1,-2,-3 Color LCD display Up to 3000 channels Transmit interruption Group call match(promiscuous) Private call match(promiscuous) Record CTCSS/DCS Emergency Alarm Monitor VOX TOT Talkaround Backlight Keypad Lock Password Lock Squelch Keypad lock LED Indicator Clock. RT3S dual band digital radio uses Digital Mobile Radio (DMR) Tier 2 Standard protocol. It is compatible with the popular MOTO TRBO series Tier I and II using standard encryption, as well as other makes and models of DMR supported radios. It is also compatible with any existing analog two-way radio operating on the supported UHF and VHF frequencies for easy migration to digital technology. GPS Compatible with Motorola TierⅠ&Ⅱ IP67 waterproof Analog and digital combiend Use time-division multiple-Access (TDMA)digital function Dual time slot for repeater; Dual time slot for point to point Lone worker Encryption function Single call, group call and all call Remote kill /stun and activate Comply with digital protocol ETSI TS 102 361-1,-2,-3 Up to 3000 channels Transmit interruption Group call match(promiscuous); Private call match(promiscuous) Emergency Alarm CTCSS/DCS, VOX, Monitor, Squelch, TOT Talkaround Keypad Lock; Password Lock Color LCD display, Backlight, LED Indicator Record Clock Firmware upgradeable. RT5 adopts humanism design, making it smart in shape, advanced in function and flexible in operation. 1750Hz tone, VOX, Alarm function, Scan function. Dual Band, Dual Display, Dual Standby. Dual band / dual display / dual standby. 1 X REFURBISHED MOTOROLA DP4800 VHF 5W DMR DIGITAL-ANALOG TWO WAY WALKIE TALKIE RADIO. 1 X GENUINE VHF ANTENNA. VHF 136-174Mhz. Our best-in-class audio and unrivaled data capabilities empower people like never before. Hot Baofeng Model. BAOFENG UV-82 The transceiver is a micro-miniature multiband. VHF /UHF DUAL-BAND TWO WAY RADIO. Frequency Bands : UHF, VHF. Band : VHF. -10 xBaofeng UV-82 ( VHF136-174Mhz UHF 400-520Mhz). Repeater Multifunctional Key. Dual Band / Dual Standby. Classic Circuit for Excellent Performance. Good used condition. Aquapac 228 VHF Classic Radio Case (Small). The Small VHF Classic Case will fit most modern VHF radios. - Also protects from dust, dirt and sand. - Normal use of radio - case does not intefere with signals or sound. 6 x USED CLEAN MOTOROLA GP340 VHF 5 WATT PROFESSIONAL TWO WAY RADIOS. VHF 136-174Mhz. Radioswap Ltd do not and have never supplied high power radios on PMR446 or any other LPD frequencies. This covers unlimited sets. 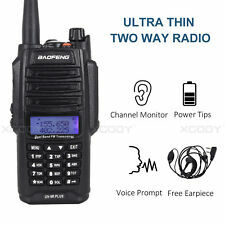 1 x RT52 Digital Two Way Radio. UHF: 400-470MHz / VHF: 136-174MHz. Direct or Repeater TDMF Tier II Modes (Hytera, MOTOROLA, Kirisun etc.). Lone Worker. Talk Around. Kill/Stun(Digital Mode). 1 x programming USB. 2 x REFURBISHED MOTOROLA GP344 VHF 5 WATT PROFESSIONAL TWO WAY RADIOS THESE RADIOS LOOK LIKE NEW! 2 x USED TESTED SPEAKER MICS. VHF 136-174Mhz. 2 x NEW BELT HOLSTERS. Radioswap Ltd do not and have never supplied high power radios on PMR446 or any other LPD frequencies. Retevis RT82 GPS Digital Walkie Talklie UHF VHF Ham Radio Car Charger Mic Cable. Condition is New. Dispatched with Royal Mail 2nd Class. 2 X MAXON SL100 VHF 5 WATT PROFESSIONAL TWO WAY RADIOS. VHF 146-174Mhz. Radioswap Ltd do not and have never supplied high power radios on PMR446 or any other LPD frequencies. This covers unlimited sets. Walkie Talkies. BAOFENG UV-5R Green. FM Radio (65.0MHz-108.0MHz). The transceiver is a micro-miniature multiband FM transceiver with extensive receive frequency coverage, providing local-area two-way amateur communications along with unmatched monitoring capability.